Stakeholders in the justice, urban and security sectors converged at the Urban Security Summit organized by SPACES FOR CHANGE ~ S4C on August 21, 2018, to discuss ways of strengthening institutional and human capacities to develop security and urban planning systems that are responsive, inclusive and sustainable. 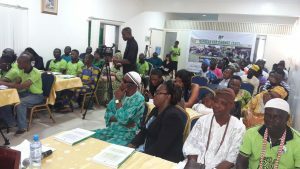 Participants at the Summit held in Lagos comprised federal and state government officials, security operatives, legal practitioners, civil society leaders, representatives of the media, academia and Lagos informal settlements. Residents of informal settlements in Lagos are often criminalized on account of their poverty. Security agents routinely raid the spaces and places where they live, leading to the arrest and detention of many. Some of them are languishing in jail without a fair trial. They are predominantly poor and lack access to the formal justice systems. To make matters worse, their efforts in seeking justice are usually downplayed by the authorities. Criminalizing and intimidating the urban poor under the guise of crime-fighting usually lay the foundation for scheduling demolitions and mass evictions in the informal settlements. ‘This Summit forms part of efforts to initiate a public discourse around the oft unfounded criminalization of people who live in slums and informal communities and involve state authorities in the organization’s campaign to improve people-government relations’, Victoria Ibezim-Ohaeri, the Executive Director of Spaces for Change stated in her opening remarks. The Summit’s two panel discussions featured panelists consisting of policymakers, development planners, legal practitioners and the inhabitants of informal communities. The first panel, Improving Community Relations with Security Agencies, shed light on the nature, frequency and reasons for police invasion in informal settlements. 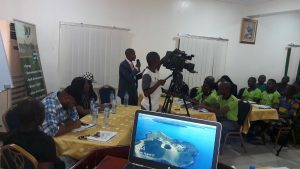 Testimonies of the representatives of Ito-Agan community in Apapa area of Lagos show how security operatives overstretch and exploit purely civil conflicts arising from traditional kingship tussle and land disputes between native chiefs to perpetuate acts that are seemingly unlawful. In this connection, the Special Anti-Robbery Squad (SARS) have invaded the community a number of times, arresting local chiefs and residents. Efforts by the community members to bail those arrested and initiate peace talks between warring parties were greeted with more arrests and detentions. Allegations are rife about security operatives taking sides with one of the warring parties, and in the process, extorting and intimidating the other side. Evictions have also resulted from these activities, with scores displaced. The second panel, Strengthening Community Resilience for Crime Prevention and Management, highlighted the difficulties slum residents face in accessing information, legal resource and justice. Many cannot access sound legal advice and representation due to financial constraints. Idowu Makanjuola’s case was a classic example of how lack of access to sound legal advice and legal representative can provide a basis for injustices to prevail, leading to public erosion of confidence in the rule of law. The mood in the room was submerged in raw emotion when Idowu, an inhabitant of Badia-East broke down in tears, as he recounted his experience with SARS. Idowu runs a viewing centre in Badia-East community Lagos State. On account of a personal friction with an acquaintance who ‘has police friends’, his viewing centre has been raided many times by policemen from different divisions and commands. Despite raiding the viewing center on several occasions in the guise of searching for guns and dangerous weapons, nothing has ever been found. The police raids assumed a frequency and pattern of extortion that culminated in the destruction of most his business assets, unceasing arrests and detention of customers found within his business environment. Monies running into Millions of Naira were extorted from his in exchange for freedom. This has continued for over three years, crippling his business. All of these began to change only after SPACES FOR CHANGE intervened in January 2018. For the first time, he was able to regain freedom without paying a dime to the police. Idowu’s story is just one out of the many stories of victimization coming out of the informal communities. A number of participants, especially government officials developed interest in the story. State authorities like the Lagos State Directorate of Citizen’ Rights, the National Human Rights Commission and media representatives expressed interest in conducting an investigation with a view towards bringing the victimization to an end. According to Mrs. Amaka Omo of the National Human Rights Commission, ‘this Summit has really helped to put faces to stories about police brutality and victimization in the country. The Commission is determined to take up matters like this and bring the perpetrators to justice. The NHRC will set up a public hearing to address cases like that of Mr Idowu and others.’ A week later, the NHRC publicly announced its intention to conduct a public hearing on cases of police brutality in Nigeria. Another panelist, a representative of the Lagos State Ministry of Housing clarified land and housing administration procedures in the state, including some of the measures that communities may adopt to avoid land tussles. Another government representative from the Directorate of Citizens’ Rights, Lagos State Ministry of Justice also informed participants about the Directorate’s mandate to use mediation as a better tool for resolving conflicts as opposed to the adversarial style of the litigation process. Mediation saves the time of the court and promotes amity in dispute resolutions. Accordingly, courts are increasingly prescribing pre-trial conferencing to settle matters already before the court. Complainants who desire accelerated hearing for their matters can file suits at the Lagos State Multidoor Courthouse where such matters can be fast-tracked. Despite the availability of platforms for dispute resolutions, one thing missing for the urban poor is access. There is a gap in knowledge and citizens are often ignorant of dispute resolution processes. For instance, one of the panelists, who is also a crime reporter, confessed that he was just learning about the mechanisms for alternative dispute resolution in the state, for the first time. This buttressed the need for government institutions to effectively publicize and disseminate information about its services. The flow of information amongst the citizenry is poor hence the inability of most inhabitants of informal settlements to access and push for justice. The interactive session provoked interesting questions and debates around security, housing and government’s responsibilities towards citizens. One issue that dominated discussions is the abuse of power by government security agencies. In most cases, they act as invasive machineries in the hands of wealthy citizens who employ them to interfere in matters outside their official jurisdiction. In recent times, the State Anti-Robbery Squad (SARS) have come under great criticism to reform their practices especially in light of overwhelming reports of citizens’ harassment and brutalization. It was also observed that insecurity and crime in communities often stem from income inequalities, lack of social and economic opportunities and urbanisation challenges like demolitions and displacement. Informal communities suffer an acute lack of infrastructure that stems from decades of governmental neglect. Often times than not, they are branded criminals and suffer devastating consequences of the negative narratives peddled about them, because of their distasteful environments. 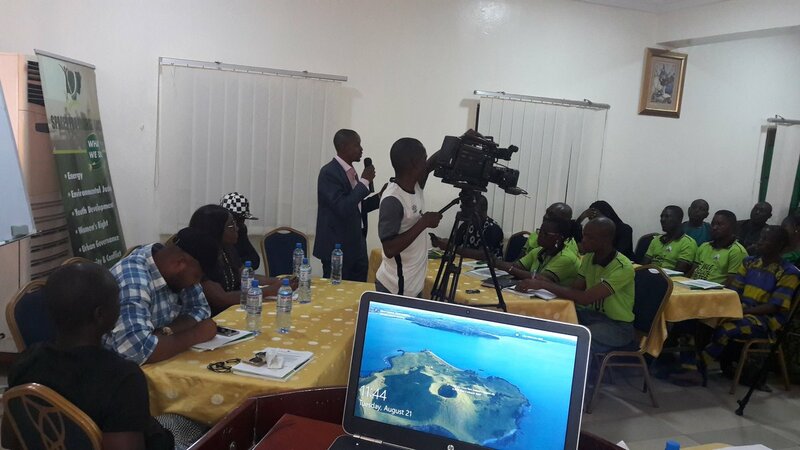 The sessions ended with words of advise to participants to engage government dispute resolution agencies like the Lagos State Directorate of Citizens’ Rights, Land Bureau Services or Office of the Surveyor General, especially when experiencing any urban land issues. Public Advice Centre (PAC) is also an effective platform that hosts the hotlines of senior government officers for accelerated response to emergency situations. The Executive Director of Spaces for Change, Victoria Ibezim Ohaeri urged the government to adopt best practices in its urban renewal processes and also accept offers from civil society organizations that reach out to them regarding proposals and solutions to urban challenges. Urban renewal programmes can be implemented effectively by addressing the challenges that informal communities face rather than displacing them without the provision of alternatives on the basis of negative labels and stereotypes.